A nother of Paul's patchwork epics (as opposed to a medley), joining the storied ranks of “Uncle Albert,” “Band On The Run” and “Rock Show.” This was, of course, the theme to the James Bond film of the same name (it’s still the best Bond theme ever). 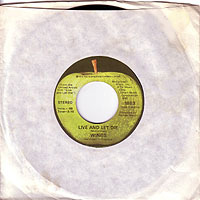 Produced by George Martin, the song featured an orchestra (presumably arranged by Mr. Martin) and was far more ambitious than anything on Red Rose Speedway. The B side is a nonalbum track that eventually made its way on the expanded CD reissue of Speedway. Sung by Denny Laine, it’s a throwaway no better or worse than the melodies included on Speedway’s album-ending medley (“Lazy Dynamite,” “Hold Me Tight”). 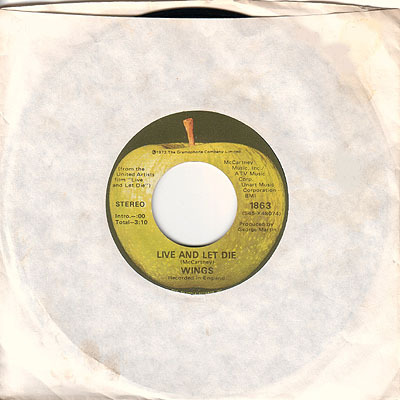 Guns ‘N Roses had a hit in 1991 with their cover of “Live And Let Die,” which was probably the beginning of the end for them. As always, there’s more to be found at Songfacts.